Ben Goldman is a highly successful area golfer who, at the age of twelve was introduced to the sport by his father, a member of Ashbourne Country Club. Goldman would go on to win the Club Championship three times. He was also a three time Club Champion at Philmont Country Club. In 1964, Goldman graduated from Cheltenham High School where he was captain of the golf team and twice competed in the PIAA State Championships at Penn State University. He attended Boston University where he was the number one player on the golf team. In 1977, at the age of 31, he made his first trip to Israel to compete in the Maccabiah games. He was the low American while his team won the Bronze Medal finishing behind England and South Africa. His better ball and team championships include: The Bud Lewis Invitational, The Golf Association of Philadelphia Better Ball Championship, Pine Valley’s John Arthur Brown Cup, The George Hoffner Memorial two times and The National Cadillac Cup twice. Goldman represented Philadelphia seven times in Compher Cup matches against the team from New Jersey and four times in Mason Dixon matches against the Baltimore/Washington area team. In 1994, he and his son, Michael, won the Philadelphia Father-Son Championship. 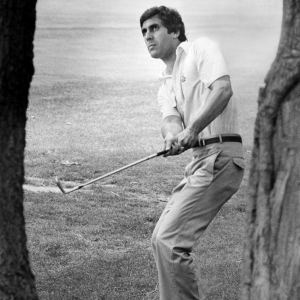 Goldman believes the pinnacle of his career came in 1980 when he won the grueling Philadelphia Amateur Championship. He also prevailed in the prestigious 1982 Sonny Fraser Tournament. Its past participants include such luminaries as Cary Middlecoff, Julius Boros, Bill Hyndman, Jay Sigel and Arnold Palmer. His involvement in the world of golf is not limited to competition. He is a lifetime member of the J. Wood Platt Caddie Scholarship Fund and from 1976 to 1982 served on the Golf Association of Philadelphia Executive Committee. He and his brother sponsored tournaments that raised over one million dollars during challenging times for the JCCs. His commitment to the Jewish community includes serving on the Board of Trustees of the Federation of Jewish Agencies and its Restructuring Committee. He is a past Chairman of the Board of Governors of the Jewish Community Centers of Greater Philadelphia.